If possible, prepare the site before you bring in the tree. Keep the root ball well watered until you are ready to plant. Measure the height from the top to the bottom of the root ball. This will be the depth of the planting hole. The top of the root ball should be at or slightly above grade. Dig the space 6-12” wider than the root ball. Break up compacted soil. Score the sides of the planting hole with the shovel blade so the sides of the hole are loosened. Leave bottom of space firm. Do not amend soil unless planting in heavy clay or poor soil. Much of our local soil contains clay. To test for soil drainage you can dig the hole for your new plant, then fill it with water and leave overnight. If most of the water does not drain by then, the soil will need to be amended. In this case, create a mixture of enriched soil by discarding ⅓ of the native soil removed from the hole and replacing it with soil conditioner, mushroom compost or composted cow manure. 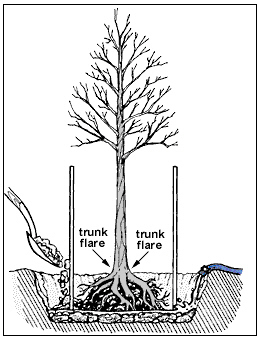 Lift tree into planting space by root ball, not the trunk. Balance tree upright in center of planting space. Be sure that the top of the root ball is at or slightly above grade. For trees in wire baskets, after the tree is in the hole, loosen the wire and burlap and fold down to expose the upper few inches of the root ball. Do not remove basket or burlap from under the root ball, as this may harm the tree. If the tree is container grown, cut and remove container. If there are dense roots on the sides of the root ball, score with a sharp knife. This will not harm the tree. Begin refilling with soil. 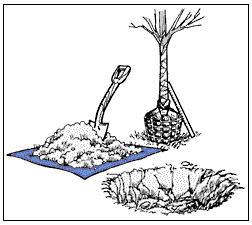 After every 3-4” of backfill, use your shovel or spade to compact the soil, which will set the tree in place and prevent air pockets in the soil. You can use the excess soil to build up a ring or dam around the outer edge of the hole to prevent runoff when watering. Prune only dead or injured branches. Do not paint wounds. Stake and brace most trees at planting time. Trees with trunks up to 3” in diameter can be supported with a staking kit designed for this purpose. Remove stakes and straps after one year, so you do not inhibit trunk development. Mulch lightly and evenly 3″ deep and out to at least the diameter of the crown of the tree. Leave a 4-6″ circle of bare soil around the trunk. Deep layers of mulch can be harmful. Do not plant flowers or shrubs directly under a tree. Do not fertilize at planting time. Water your newly planted tree thoroughly by using a slow, deep-watering method. The roots of newly planted trees dry out faster than the soil around them, so it is very important to monitor the soil moisture close to the tree. Watering slowly (turn water down to a trickle) allows water to penetrate deeply which encourages widespread root development. Soaker hoses or watering bags such as the ‘Treegator®’ can be very helpful during the first one or two growing seasons after planting. Remember to check newly planted trees frequently to be sure they are getting the water they need to survive. 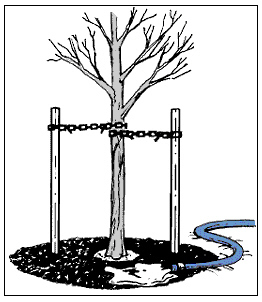 Keep lawn mowers and string trimmers away from tree to avoid wounding the trunk. Reduce herbicide use near tree and in surrounding lawn. Never fertilize newly planted or stressed trees. It should be applied (if absolutely necessary) only after first year. Start an annual tree inspection program while tree is young to head off problems early. Prune dead or injured branches immediately. Prune while young to maintain size and shape, beginning in the second growing season. Never top trees to reduce height. Consult a pruning guide for proper pruning techniques! Call an insured tree care professional for advice on large pruning jobs, hazard trees, and insect or disease problems. Non-professionals should never prune near utility wires. Continue to water during dry periods for 2-3 years after planting and whenever severe drought conditions exist.